This made her unpopular, for the teachers at Erebus did not like imagination; they liked neat handwriting. So they gave Iris lots of detentions, to shake the dreamer out of her. For her twelfth birthday, she gets the usual from her parents*, but those aren't her only gifts. A boy on a skateboard delivers a third present -- a huge, illustrated version of Bullfinch's Mythology. Though Iris has no idea who sent it, it's certainly the best birthday gift she's ever received. Handwritten notes in the margins lead Iris to the Margate boardwalk and to Poseidon's Clam Shack, which is run by none other than Poseidon himself. And that, of course, is just the beginning. Behind him, the club filled with applause. When it subsided, a silky voice yelled out, "Yo, Atlas, who's at the door?" The huge man held her gaze and yelled back, "Some shorty. Says you're expecting her." Kills me every time. Can't you imagine Sarah Deming writing that and just howling? That's what I would have done. Anyway. I liked this book a whole lot. A Whole Lot. Each god/dess that she meets tells her a story. As each story is told by a different character, each one has its own flavor and rhythm and perspective. The book occasionally reminded me of Jean Ferris' Love Among the Walnuts, oddly. I'm not sure exactly why. I'll think on it. The Appendix was pure Klise, though unillustrated. Deming's treatment of the gods is closer to Neil Gaiman's mythology than to Rick Riordan's -- very few modern people continue to tell their stories, let alone believe in them, and due to that, their power has waned and some of them have even died. While I don't think it'll be as hugely popular as the Riordan books, I think it's a better book. Don't get me wrong. 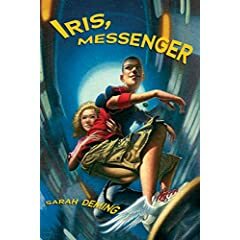 I like the Riordan books a lot -- they're lots and lots of fun -- but Iris, Messenger has more depth. If I was still a bookseller, I'd hand sell the crap out of it. Well, I would when it comes out. Which is next May. Sorry. *I didn't catch what she got from her mother, unless it was the bacon, but I know she got a brand-new Bible from her father. Your review had me all set to rush to the local bookstore and purchase a copy. Imagine my dismay at learning I have to wait at least 6 months for the privilege. ACK! In the meantime, I'd better write it down somewhere so I don't forget about it when it comes out. HA! (Atlas shrugged.) Hopefully in future books she'll have characters meet up at the fountainhead. Thanks for the heads up on this book, now I'll have to read it. This sounds phenomonal. Must go reserve a copy. seeking sarah....trying to contact her. please refer my request to sarah's typepad address, i can't seem to contact her there. I read this book and it was wonderful. Wrote this in hopes of getting more people to read it. Spot on with this write-up, I actually assume this web site needs way more consideration. I’ll in all probability be once more to read way more, thanks for that info.